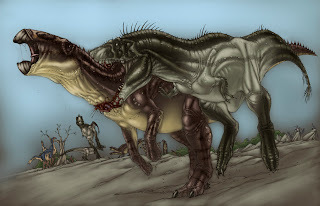 Carnosauria: Tyrannosaurs part the second: Tarbosaurus Attack! A ichnosite from the Early Cretaceous of USA, made by a large-sized tharopod and a sauropod, supports your picture. You know, I did think about that before I drew this but didn't make the connection until you mentioned it. Thanks!